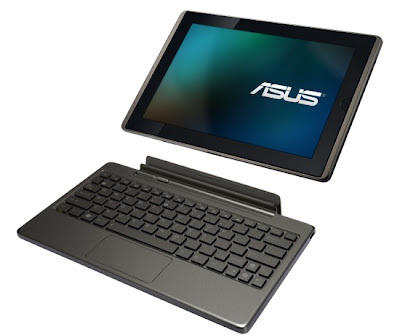 At CeBIT 2011, ASUS just has unleashed their new tablet netbook, called ASUS Eee Pad Transformer tablet. The Eee Pad Transformer is a slim and lightweight hybrid tablet with features Android 3.0 HoneyComb for operating system and a full size docking keyboard, so you can close it to look like a netbook. ASUS EeePad Transformer hybrid tablet will be release in April 2011 with optional storage and connectivity, Eee Pad Transformer 16GB Wi-Fi has price tag at 400 euros and Asus EeePad Transformer 64Gb with 3G at 700 euros. The ASUS Transformer tablet is packs with a 10.1 inch capacitive touchscreen display with 1280 x 800 pixels resolution, a 1 GHz NVIDIA Tegra 2 dual core processor, 1G of RAM, 16Gb to 64GB of storage, rear 5MP camera, front 1.2MP camera for video call, Stereo speakers, microSD card slot (which supports SDHC), GPS, Bluetooth 2.1, Wi-Fi, USB 2.0, weighs about 680 grams and mini-HDMI port for connect to external device. ASUS Eee Pad Transformer also offer optional 3G, full 1080p HD video playback, Adobe Flash and battery that provide of up to 16 hours of battery life with docking station.